This is the second part of this profile, which starts *right* where part one ended. This shutdown was ordered just as the Department had reached its manpower targets. Between Heather’s 1975 departure and 1980 the Department had assembled a Beta Flight as a reserve/training team. It even had just formed a Gamma Flight as a third echelon, with the recruits moving in weeks or even days before the Department was ordered to shut down. Though greatly affected by the demise of his work of two decades, Dr. Hudson found it impossible to leave his country without superhuman protectors. He kept his battle suit and an unrevealed amount of equipment, and remained ready to intervene as a volunteer. Thus, when threatening streams of energy were reported in Northern Canada, he unthinkingly flew there to investigate. Thankfully, Heather realised that going in alone was stupid. 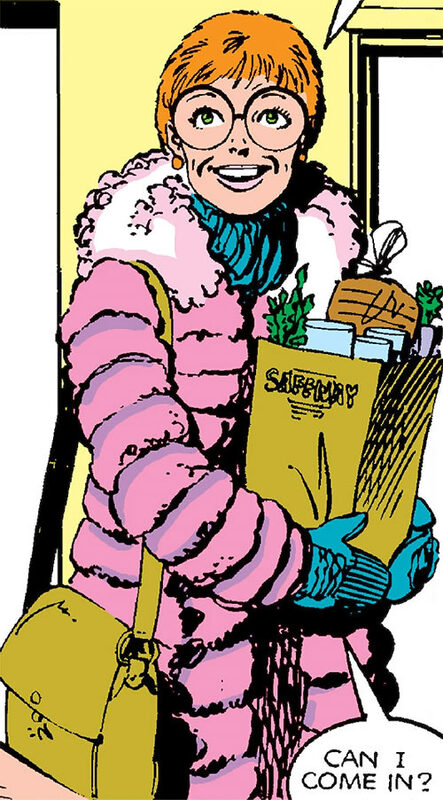 She used backup equipment installed in their house to summon the discharged members of Alpha Flight. All assets responded — some with the help of Canadian officials who had not been informed yet that Department H was gone. Though there was a lot of improvisation, the team scrambled by Heather to back her hubbie up met and defeated the Great Beast Tundra, a major mystical menace. The Flight debriefed at the Hudsons’s apartment in Ottawa, and they decided to remain active as non-governmental super-heroes. However, years of plotting for revenge against Jimmy and Heather Hudson were about to come to fruition. Heather’s first boss, Jerry Jaxon of Am-Can Oil, had borne the brunt of Dr. Hudson’s decision not to have the American military obtain his technology. Am-Can fired him and went all-out to blacklist him and wreck his life. After years of hardship, Jaxon saw Guardian on TV, and deduced that it was James McDonald Hudson. He then brewed up a plan to gain revenge against the Hudsons with Roxxon Oil’s help. Jaxon’s plot started in 1984, with a dream job offer from Roxxon Oil. After Roxxon made a firm offer to hire the then-unemployed Dr. Hudson, the Hudsons left their house in Ottawa to move to Brooklyn. Dr. Hudson moved there first and got the Brooklyn apartment while his wife finished with the logistics in Ottawa. When she arrived in New York Heather was detained by Delphine Courtney, Jaxon’s accomplice. As she was being held, Jaxon launched his attack against Dr. Hudson, cybernetically controlling a Box robot and assisted by the rogue members of Gamma Flight. After he’d killed Mac, he intended to execute Heather. He mistakenly thought that she had been a part of the plot to steal the Hudson technology. Mac killed Jaxon via cybernetic feedback through the Box robot, but was left with his Guardian suit critically overheating. While Heather managed to locate her husband in the chaos following Jaxon’s death, all she could do was witness Mac explode and combust right in front of her as the circuitry overloaded. Heather was traumatised by Mac’s death. Her health decayed, she was wracked by nightmares. She also suffered from crushing guilt, thinking that she may have cost her husband his life by distracting him as he was about to shut down his suit. Since there was no body left to bury, she kept having nightmares where her husband was back as an incandescent revenant. She eventually convinced herself that she was responsible for his death. With Mac’s death Alpha Flight shut down and dispersed. But her closest friend on the team — Dr. Twoyoungmen — took her back to Calgary and became her physician as she dealt with the trauma. Eugene Judd (aka Puck), who was secretly in love with Heather, stuck by her and provided morale support to both Mrs. Hudson and Dr. Twoyoungmen. Even though Heather forced herself to recover, there were more bad news. Department H was so highly classified that the government couldn’t acknowledge anybody’s career therein. There wouldn’t be any recognition of Dr. Hudson’s sacrifices for Canada. It also meant that Mrs. Hudson couldn’t earn a widow’s pension or Mac’s life insurance. At this point Heather was widowed, homeless, estranged from all her relatives, unemployed and still reeling from trauma. Though she put on a brave front, she wasn’t making much progress in rebooting her life. After two months, the ever-present Judd convinced her to come with him to the Ontario Place entertainment centre to change her mind. There they witnessed an attack by an alien Plodex hidden under water. Seeing that a baby had been taken and knowing that Judd couldn’t swim, Heather immediately dove in to save the infant. But she was too late and was herself attacked. Judd got her out of the water, though the Plodex shredded Hudson’s legs. Luckily, there was no major tissue loss. Wolverine came to visit Mrs. Hudson some weeks into her hospital stay. 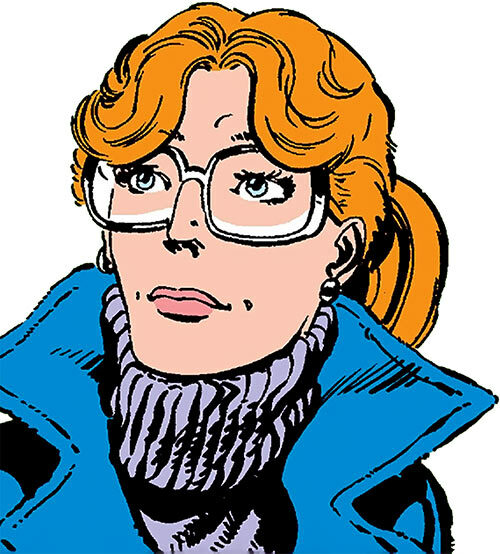 As they were discussing, Puck dropped by to pitch the idea that Alpha Flight re-form with Heather as the leader, since she had been the glue holding the early project together. Wolverine supported the idea. Eager to honour Mac’s memory, and though she didn’t quite see how she could lead a super-heroes group, Heather agreed to become Alpha’s new leader. Reassembling the team took a while. Jean-Paul Beaubier snottily turned Heather down. On the other hand two old friends, Michael and Elizabeth Twoyoungmen, agreed to follow her lead. The Twoyoungmens and Snowbird had just discovered that Elizabeth, whom Heather used to baby-sit, was a prophesied mystical figure of the First Nations, the Talisman. Heather’s legs were still heavily bandaged and she had to walk with a cane but Shaman, Talisman, Snowbird and Puck travelled through time and foiled a plan by mystical enemies of the First Nations, the Great Beasts. Sasquatch and Aurora also rejoined the team. That was in large part because Sasquatch was worried about his increasingly savage transformations and wished to be examined by Dr. Twoyoungmen. 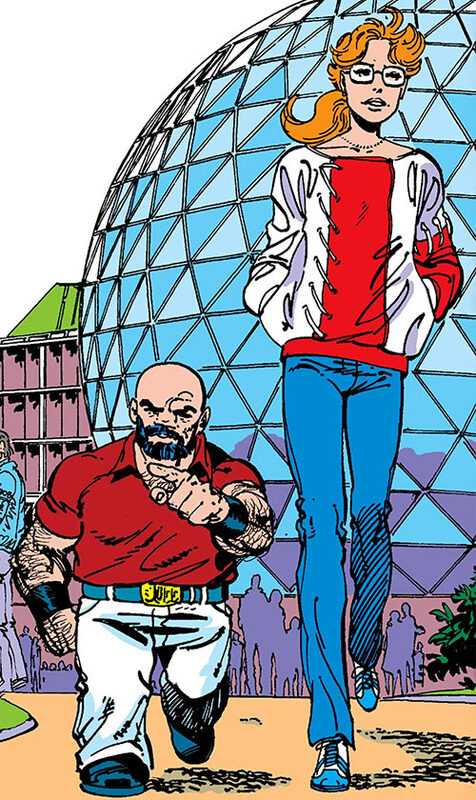 When the X-Men came to Canada to investigate disappearances, Heather offered to Professor X to have Alpha Flight accompany them. The Professor readily agreed despite the poor history between the two teams. Northstar also joined the expedition for personal reasons. The joint teams found a grandiose place of miracles and healing. There, magical light turned Heather into a giant warrior, fixing her very poor eyesight and granting her mystical powers to lead. She took the name Guardian. However, the two teams eventually discovered that it was all a trick. The boons came at the price of destroying magic and creativity. All rejected their gifts after discovering that they were the work of Loki, god of lies. The experience in the magical city helped bring Alpha closer together. Though Northstar did not rejoin the team, he left on good terms with Hudson. 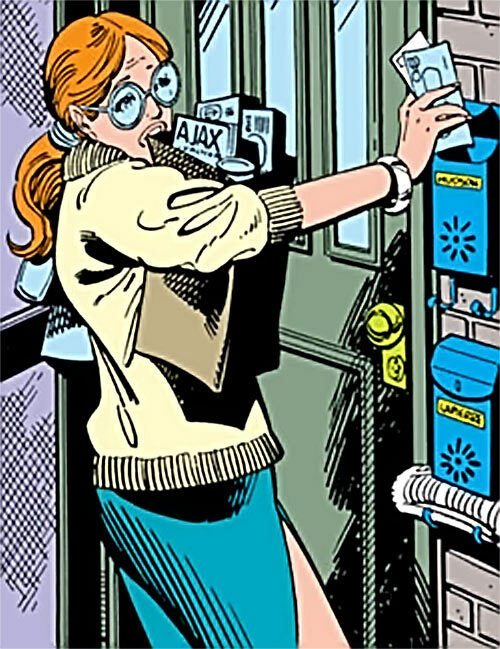 At this point Heather leased cheap business space in Vancouver, and bought basic equipment such as a police scanner. The source of equipment may have been personal belongings of James Hudson, but the source of the funds for the lease and other expenses was not mentioned. One gets the impression that an ally of the Flight, Roger Bochs, was instrumental in setting the headquarters up. For months, Alpha Flight clumsily threaded water, with members leaving and rejoining all the time. The team chiefly focused on solving the various problems afflicting its members. Sasquatch was killed but his soul was eventually recovered and housed into a Box robot. Roger Bochs joined as a techie. Snowbird announced that she was leaving Earth but secretly remained to be with her human boyfriend. Northstar was revealed to havebeen involved with Québecois terrorist fringes. Heather spotted her supposedly dead husband in a crowd. It was a trick – the same robot once disguised as Delphine Courtney had been reconfigured and disguised as James MacDonald Hudson. Since the presence of various robotic parts would be detected sooner or later, the fake Mac fed Heather and Alpha an incredible tale. In this story, Mac had not died but had been accidentally teleported to Ganymede. Space aliens saved him and helped him recover for months, rebuilding parts of his destroyed body using his suit’s technology as a template. This allowed “Mac” to present himself as a cyborg as a cover for its robotic nature. To limit risks, the ruse didn’t go on very long. The robot soon led Alpha Flight into an ambush at the West Edmonton Mall. 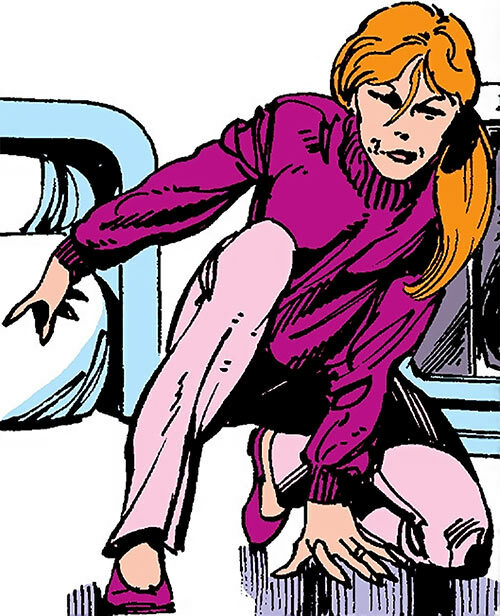 But Alpha Flight prevailed thanks to reinforcements – primarily Madison Jeffries. Chaos continued. After a strange encounter with the Beyonder, much of Alpha attempted a weird plan to procure a new body for Sasquatch without warning Heather. Though she discovered the reckless scheme at the last minute, it was already too late to stop the procedure. 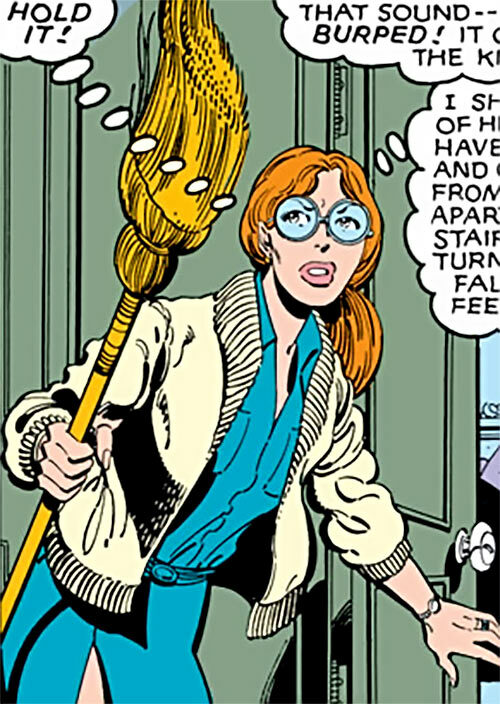 Her so-called staff had managed to yank a mindless, furious Hulk from a place of extradimensional imprisonment. Heather usually wears a huge pair of glasses, and cannot quite operate without those. She’s thin – probably underweight. Her hair have a distinctive colour, closer to orange than common shades of red. She’s not comic-book-gorgeous, but she’s undeniably cute and has a lot of charm. She’s fond of wearing an old pair of cut-off blue jeans as a mini-short when the weather allows it. 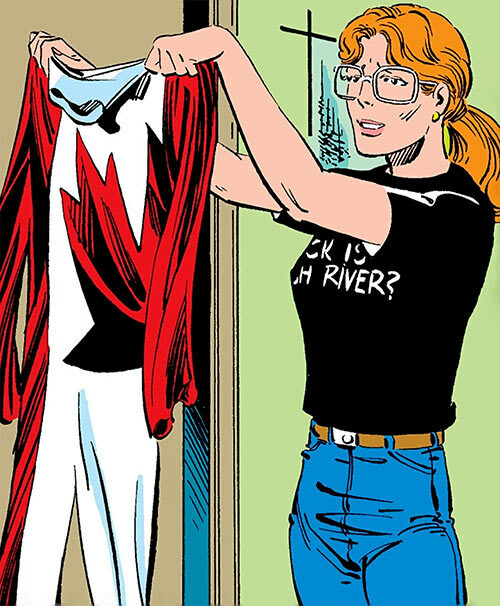 Her black T-shirt reading “Where The Heck Is High River ?” puzzled fans for decades (it doesn’t seem to be a reference to anything). She often wears warm colours, with a preference for dark pinks and magentas, and often wears long skirts split high on one side. After becoming Alpha’s leader she added a lot of red and white items of clothing to her wardrobe. After Mac’s death, Heather was badly affected. She looked 15 or even 20 years older and became downright gaunt. It took months for her tor recover. Catch the best man possible ASAP. Eventually have and raise children in a big house. She got herself a basic job to meet people and get money. But this seemed intended to last until she’d become a housewife. After she decided that Mac was The One, he became the central everything in her life. The rest wrote itself. However, Mac’s workaholic behaviour occasionally made her life difficult and her spirits low. Yet Heather is a dynamic problems solver, using her people skills and determination to fix situations around her and have things roll smoothly. She will seldom hesitate to step in and take action, taking charge if nobody else is more qualified to – even if physical danger is involved. Howbeit, she never made the leap from that to seeing herself as leader material. In her head she was just a resourceful secretary and a good wife. 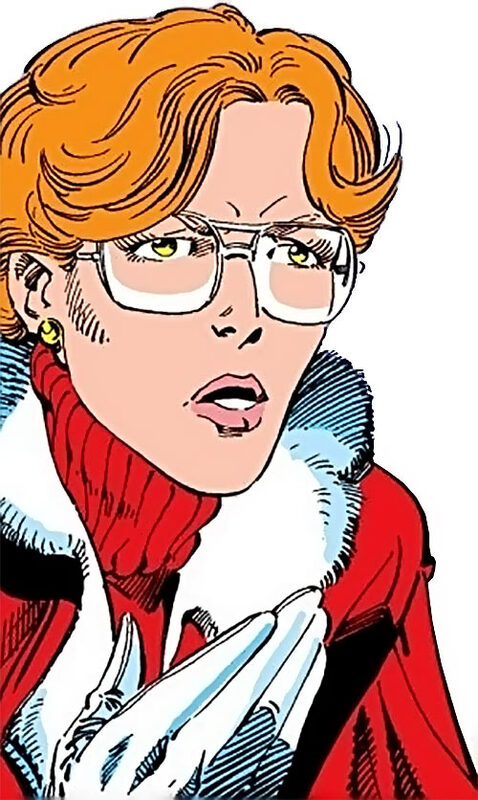 When she was pushed into claiming leadership of Alpha Flight, it was a desperate attempt to exorcise Mac’s ghost and serve her country rather than any sort of ambition. Once Heather was the boss, her sense of responsibility, and the anxiety she’d been living with ever since Mac took on a field role, caused her problems. She couldn’t generally be in the field with the team, and thus had to stay behind to worry and hope nothing catastrophic would happen. She thus tried to be in the field to assuage her anxiety and do her job, though it wasn’t the most reasonable stance. Mrs. Hudson is responsible, intelligent, has a highly developed horse sense, and actually cares about people. She approaches things in a sensible, organised, pragmatic manner and without flourish. Heather being something of an everywoman, she has no specific speech patterns. She’s lively and speaks with humour, but it’s everyday stuff and she makes a liberal use of clichés and common turns of phrase like most people do. Clearance (Canadian gov’t, Low), Language (A bit of French). Alpha Flight (Low), Puck (Eugene Judd) (High), Wolverine (Logan) (High). An UNIFORM [BODY 03, Cold immunity: 01]. A Visor [BODY 01, Shade: 01]. A Browning HP [BODY 03, Projectile weapons: 04, Ammo: 13, R#03]. Connected, Equipment 2, Language 1 (some French). Deception 2 (+3), Expertise (Executive assistant) 5 (+7), Insight 3 (+4), Persuasion 2 (+3), Vehicles 2 (+3) (Limited 2 to common land vehicles). Late during this era Heather had Equipment 2 – a Light Pistol, a corrective visor (with Enhanced Fortitude 2, Limited 3 to Bright Lights), cold weather clothing and some minor consumer electronics (Dictaphone, pocket thermometer, etc.). Disability Heather is very, very nearsighted. Relationship Various subplots and problems re. : her husband and her parents. Trade-off areas Attack/Effect PL 1, Dodge/Toughness PL 1, Parry/Toughness PL 1, Fort/Will PL 3. Point total 27. Abilities 10, Defences 5, Skills 7, Powers 0, Devices 0, Advantages 5. Equiv. PL 2. 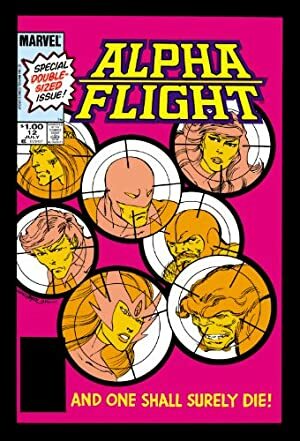 Source of Character: The first 28 issues of Marvel’s Alpha Flight plus flashbacks to that time or before. Heather as magically transformed by Loki.